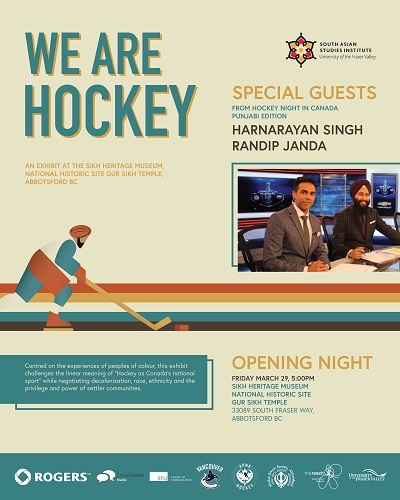 The South Asian Studies Institute at UFV is pleased to invite you to the next exhibit opening reception at the Sikh Heritage Museum titled ‘We Are Hockey.’ The exhibit is a vibrant counter-narrative to the commonly held assumption that ice hockey is a ‘whites only’ sport. We highlight the contributions of peoples of colour across Canada who have played critical roles in shifting the invisible boundaries within the sport. Our opening reception on Friday, March 29th beginning at 5 pm includes an opening address by Dr. Joanne Maclean, President and Vice-Chancellor at UFV. The reception will also feature your chance to meet with two Hockey Night Punjabi commentators, Randip Janda and Harnarayan Singh. Please do keep an eye out on our Instagram and social media pages (@ufvsasi) for updates. If you can’t come to the opening reception, the exhibit is also available all year long for viewing.